ForFarmers believes that reporting on sustainability performance is an obvious and responsible thing to do. ForFarmers believes that reporting on sustainability performance is an obvious and responsible thing to do. To benchmark progress and performance, ForFarmers uses transparent reporting methods. We employ the reporting standards of the Global Reporting Initiative (GRI) for this purpose. In addition to transparency, sustainability governance is essential to our sustainability performance. ForFarmers has a Sustainability Advisory Board with external participants, and an internal Sustainability Task Force. 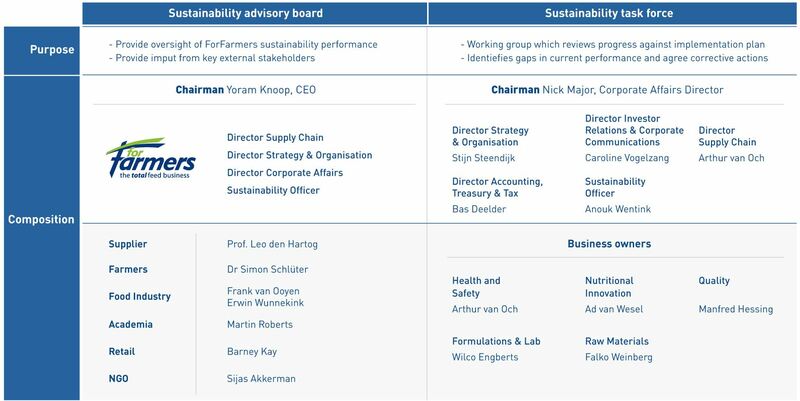 The Advisory Board is chaired by the CEO of ForFarmers and consists of external representatives from the retail sector, NGOs, academia, the agricultural sector and the research world. The internal Sustainability Task Force consists of members of the Executive Committee and representatives of the various functional areas, because sustainability is integrated into all elements of our organisation. ForFarmers has aligned its sustainability strategy with the United Nations’ (UN) Sustainable Development Goals (SDGs). They aim to end poverty, safeguard the planet and provide prosperity for all. The table below shows the relationship between ForFarmers' KPIs and the UN's SDGs. These SDGs are the ongoing guiding principles for ForFarmers. Sustainability is a collective task. ForFarmers therefore works together with other parties in the chain. We are affiliated with various external initiatives. Go to the External organisation representation overview.